Our office is located at the intersection of Arlington Blvd + Prosperity Ave (click here for a map / directions). Ample free parking is available in the multi-level parking garage as well as side lot and street parking. We encourage our patients to also take advantage of public transportation such as the WMATA metro and bus systems, in addition to Uber, Lyft, taxis, and other ride sharing services. 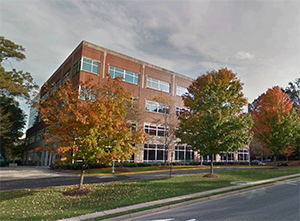 Our office is convenient to all areas of Northern Virginia, including Fairfax, Falls Church, Vienna, McLean, Tyson's Corner, Merrifield / Mosaic, Burke, Springfield, and beyond. Our calm, modern and comfortable reception area is a nice place to start your appointment at our office. Our patient coordinators will be glad to assist you with any questions about our new patient forms. We do our very best to get a few pieces of necessary information from you when we make your appointment by telephone, and then research your insurance plan and benefits so we can share that information with you at the time of your appointment. Our office is very good at seeing patients at the scheduled time. However, if you happen to arrive early, we are pleased to offer a few simple refreshments. One thing that separates us from other offices is that we believe in taking the time to answer the questions of our patients fully. Some patients may have more questions about the clinical plan, while others would like more information about their insurance benefits and payment options. We believe in taking the time to make sure that those questions are fully answered. Our front-office coordinators are well trained with all PPO insurance plans and will be happy to share their knowledge and experience in navigating your insurance benefits with you. 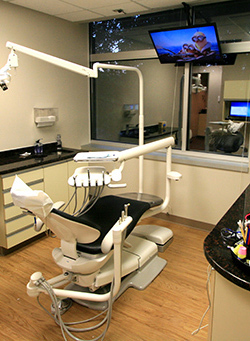 Our equipment is top-of-the-line equipment, newly installed, and well maintained in order to ensure that each patient receives state-of-the-art treatment. The equipment may not make a dentist, but not having to work around aging or deteriorating equipment is a plus for both dentist and patient. Each treatment room is also equipped with ceiling-mounted patient monitors, where we can view x-rays and photos with patients, in addition to enjoying a full range of popular and up-to-date movies and TV shows. Modern dentistry has low-radiation x-ray devices that use 90% less radiation than old film-based x-rays. 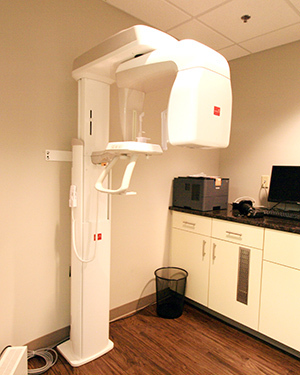 Even our panoramic x-ray unit (pictured) is fully digital. In a digital x-ray system, low-radiation is possible because the computer is processing and enhancing the image received, rather than film - which cannot be manipulated by software. With film, "what you get (via radiation) is what you get." Another benefit with our digital x-ray systems is that the image quality is hugely better, compared to old film-based x-rays. 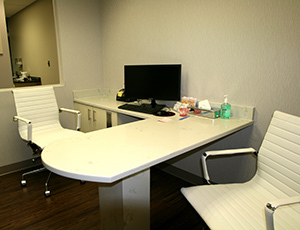 For treatment discussions where photos, x-rays and other computer tools can be helpful, we have a separate and discreet consultation room. 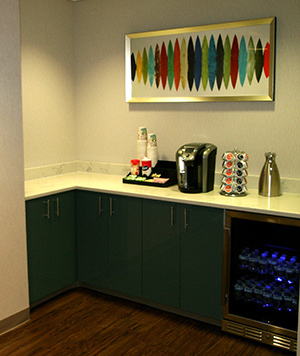 We also find this consultation room helpful when having longer discussions in a comfortable and private setting. 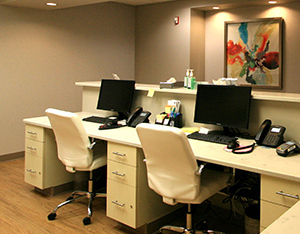 A high quality office does everything right for the safety of their patients. 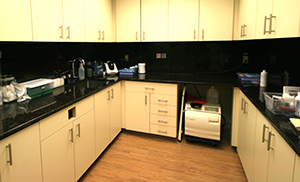 Our office utilizes the latest in sterilization tools, supplies and techniques to ensure that every treatment is done in a safe and sterilized setting. Our sterilization system includes a high-temperature / high-pressure autoclave, heated ultrasonic bath, individually cleaned and wrapped instruments, biocides and other disinfectants, and constant training and monitoring to ensure that our systems and processes are followed by our entire team.